Aviation ordnance Marines handle aviation ammunition issues from safety to procurement. This occupational field includes organizational and intermediate maintenance of aircraft weapons systems, guns, gun pods, bomb racks, missile launchers, and aviation ordnance support equipment. 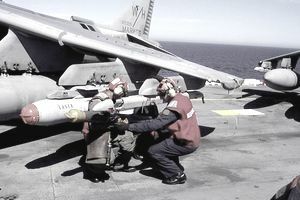 Aviation ordnance Marines are qualified and certified under current directives. Formal schooling is provided to Marines entering the OccFld. A wide variety of billet assignments are available as shown in the figure later in this entry. Marines entering this OccFld receive MOS 6500, Basic Aviation Ordnance Marine, and attend Aviation Ordnanceman, Class AO Al School at Pensacola, FL with follow-on training at one of several CNATT AO(C) Courses dependent upon anticipated fleet assignment. Upon completion of AO(C) Course, they will participate in routine aviation ordnance functions and attend specialized schools while training for a designated MOS within the OccFld.